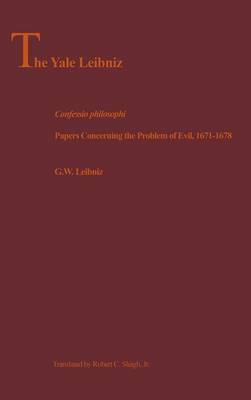 This volume contains papers that represent Leibniz's early thoughts on the problem of evil, centering on a dialogue, the Confessio philosophi, in which he formulates a general account of God's relation to sin and evil that becomes a fixture in his thinking. How can God be understood to be the ultimate cause, asks Leibniz, without God being considered as the author of sin, a conclusion incompatible with God's holiness? Leibniz's attempts to justify the way of God to humans lead him to deep discussion of related topics: the nature of free choice, the problems of necessitarianism and fatalism, the nature of divine justice and holiness. All but one of the writings presented here are available in English for the first time.